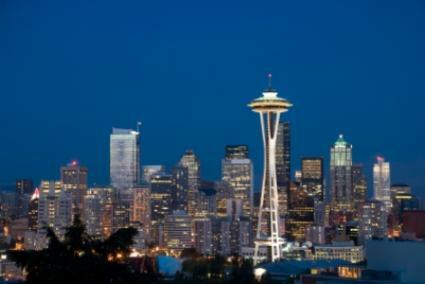 Experience the numerous tourist attractions in Washington state. Home to Mount Rainer, the Hoh Rainforest, and the Lewis and Clark Trail, the state is filled with beauty as well as rich history. Mount Rainer - In the Cascade Mountain Range sits the famous Mount Rainer. Enjoy glaciers, walking trails, wildlife, and wildflowers. Hoh Rainforest- Walk on the 17.5 Hoh River Trail, camp here, or just enjoy the many shades of green in this area that receives 13-feet of rainfall each year. The Rainforest lies in the Olympic National Park, in the northwestern part of the state. San Juan Island - Surrounded by the Puget Sound, this island boasts of beaches, marinas, harbors, parks, and even shopping. Palouse Falls - The last of the waterfalls left by glaciers, this peaceful and beautiful scene in the southeastern part of Washington is one you won't want to miss. Lake Chelan - Located in the North Cascade National Forest, this lake is one of the deepest in the USA. Lewis and Clark Trail State Park- On the shores of the Touchet River lies this beautiful camping park. Whidbey Island - cross the Pudget Sound by boat or ferry to this island and visit the historic waterfront communities of Coupeville, Langley, and Oak Harbor. Chief Timothy Park is situated near the original site of the Nez Perce Indian Village occupied for over 8,000 years. Enjoy 282 acres of freshwater shoreline for swimming, fishing, and waterskiing. Makah Cultural & Resource Center has a museum that is dedicated to educating the public about the Makah Tribe and their 3,000-year-old fishing village. Here in the northwest, you can experience the history of the tribal people who learned the craft of surviving off the land. Walla Walla - Sunset Magazine named Walla Walla the Wine Destination of the Year, beating Oregon's Willamette Valley and California's Napa-Sonoma. This lush green area, in the southeast of Washington, has three colleges and much culture and nature. Visit The Three Rivers Winery of Walla Walla, and in the summer enjoy the free outdoor lawn concerts the winery offers. Tacoma - Washington's second-largest city holds a rejuvenated theater district and the Chihuly Bridge of Glass. Spokane - Serving as a gateway to the Rocky Mountains, this city is filled with art and sunshine. Seattle - You can't miss one of the most popular places locals like to take visitors when they come to Seattle-- the Pike Place Market. See fresh produce, seasonal flowers, and local entertainment. Consider car rentals, buses, and trains. The Sounder, a light rail line that passes between Seattle and Tacoma, is a great way to travel. See the state via Amtrak which goes both north-sound and east-west. For heading out to the islands, choose from the largest ferry system in the USA. Ten routes carry passengers, bikers, and vehicles across the Puget Sound and the Straights of Juan de Fuca. Now that you see all Washington has to offer, it is time to venture out west. Check for inexpensive air travel rates and you are on your way. Be sure to bring your camera to remember all the attractions you visit!